March of 2014 was probably one of the lowest times in my life. I had just found out that the guy I had been dating and living with for the past 8 months had basically been cheating on me the whole time. I, of course, broke up with him but couldn’t afford to kick him out of my rental. I was depressed and alone, and I turned to alcohol and sleeping with other guys in the hopes that I would feel better. That only made me feel worse. I was a hot mess. When my period was late, I tried to brush it off as just stress. It’s happened before, so I didn’t think much of it at first. Then a week went by and still nothing, I started freaking out. What if I was pregnant? I slept with so many different guys, there was no way I could know who the father was. I never thought I would end up in this situation. I decided to go buy a pregnancy test, I went to a CVS near my work and was so nervous. I looked in the family planning section and didn’t see the tests, I had embarrassingly to ask the pharmacy tech where they were. I took it home and went straight to the bathroom. I’ve taken one before, so I knew the drill and I was so sure that it was just going to be another negative. Not even one minute after I peed, that two pink lines popped up. I figured it was just a faulty test so I went ahead and took another, again positive. That’s when I started to panic, I took one more test and again it was positive. I went to my bedroom in disbelief, staring blankly at all three positive tests. I felt like I needed to tell someone, and the only other person in the house was my ex (one of the potential fathers). His first response was, “Oh the doctor said I can’t have kids because I was kicked in the nuts as a child.” Really? I then told the other two guys, one of them another ex who I had been love with for such a long time. I was still in love with him at that time, but he immediately started calling me, telling me how keeping this pregnancy was the biggest mistake of my life. He even offered to pay for my abortion and to take me out drinking afterward. I had already made my mind up, though, I was keeping this baby and I would find a way to parent it. The next step was to tell my mother, who as soon as I told her said I should look into adoption. She then reminded me of a brief moment in time (when I was younger and still a virgin) that I said that if I ever got unexpectedly pregnant I would choose adoption. That was true, and so when we went to the pregnancy center to confirm my pregnancy I tried to keep an open mind about adoption. The center gave me a whole bunch of pamphlets about how much it costs to take care of a baby, and also counseled me on adoption, and told me about how in an open adoption I could still visit and keep contact with my baby. I took everything home and thought it over, I tried to do the math of how I could raise a baby alone and nothing was adding up. I knew I couldn’t do it alone financially, and none of the potential fathers as going to help me. My mother made it very clear that no one in my family was going to help me. She did offer some support during the pregnancy, but mostly it was encouraging me to make an adoption plan and shooting down any ideas I had for parenting. The pregnancy center offered me a free ultrasound, and at 6 weeks it was just a moving blob on the screen. It took me a few seconds to realize that the movement was the baby’s heartbeat. At that moment everything became real for me, I was having a baby. I told some of my close friends at the time who offered to try and help me out, we talked about getting a trailer and setting up on a part of my friend’s property for me to live there. I knew, though, that nothing was going to come of it and I realized it was hopeless. I didn’t know how I was going to do this on my own. The adoption plan started to sound more and more like my only option. So while I was still in my first trimester, I called one of the listed agencies in the information the pregnancy center gave me. The lady on the phone was very sweet and told me she was going to send out a person to talk to me at my home. I waited all day, but no one showed up. I felt really alone and lost that night, then I remembered a couple of old friends of mine who had been looking into adopting a baby. I messaged them on Facebook and they replied immediately and were very interested in working on an open adoption plan with me. Over the next few months the couple kept almost constant contact with me, they were at my ultrasound appointment when we found out I was having a baby boy. They really seemed like a perfect match, but in the back of my mind, I felt something was off. One of the biggest things I wanted in the adoption plan was to be able to help pick a middle name out. I had a name I had picked out way before I ever got pregnant. I knew the likelihood of them wanting it as a first name was very low, but I really hoped that they would at least consider it as a middle name. They didn’t want anything to do with it and refused to even listen why it meant so much to me. Another issue I had with the potential adoptive mother was that she was very insistent on trying to breastfeed my baby herself when he was born. At first, I didn’t really care, but as I thought about it the idea got even weirder sounding. I was already planning on trying to breastfeed and pump for him so that he would have the best start, but she didn’t want me to do that at all. There were a few other quirks about them that I didn’t care for, but the final straw came when I was about 34 weeks pregnant. I had been in and out of the hospital since the beginning of my third trimester because of an inflamed gallbladder. My gallbladder had been causing me a lot of pain and causing me to go into preterm labor. During each of the hospital stays the couple was more concerned about the baby, naturally, but had no concern for my well-being. I thought to myself “How can I trust these people to keep their promise of an open adoption when it seems like they don’t even care about me as a woman who will give birth to this child?” I finally decided to call it off with them, I needed to be able to trust the family I was going to give my baby to if I was going to do adoption. I was still in the hospital when I called and told them, and afterward, I just laid there thinking “Now what?” I still was basically homeless, I had ended up moving in with a family friend who told me I could only live there if I was going to put my baby up for adoption. My job had basically cut my hours back to nearly nothing, so I didn’t have very much money saved up. I was still living paycheck to paycheck, and I knew I had no one to turn to and nowhere to go with a newborn. The hospital sent a social worker to me, who then gave me a list of adoption agencies to call, I still wanted to parent but I didn’t know how I could do it alone. As I looked at the list I recognized one agency, the same one I had called earlier but no representative was sent out to assist me. I decided to give them one more chance and called again, I thought adoption was my only choice to give my child everything he deserved. They sent out a caseworker right away, who met me at the house I was staying at after the hospital let me go home. She got to work right away, got all of my information and the information of the potential fathers. She then asked me what kind of adoption I was looking for and what I was expecting. 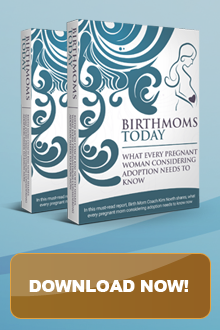 I had already had a big list written up, I had done some research and read some stories about birthmothers who had very open and happy adoptions. I wanted that too, I thought if I had that much contact and openness it would be like I didn’t really lose my baby after all. My caseworker though shot down all my ideas, she told me that I probably wouldn’t be able to find a family who would agree to all of the openness, especially in such a short time frame. I was very devastated, but I was determined to find a family for my baby. She told me that they had a “contract” open adoption which meant I would get updates every three months for the first year, then two updates the second year and once a year visits and updates after that. I agreed to the terms in the hopes that I would find a family who would be willing to have more contact. The next week she came by again, this time with a small stack of profile books for me to look at and read. Some of my terms I had asked for was that the family had to live in or near the state I was in, had to be a family with no other kids, and open to having an open relationship. The first two books were of families who lived on the other side of the country, and the last two were local. The first in-state family I looked at seemed very nice but they were too “sporty” and traveled a lot. The second in-state family really stood out to me the most. They seemed like a very down to earth family, the husband was an environmental engineer and the wife wanted to be a stay at home mom when they finally had children. They were exactly who I would have wanted to be my parents growing up. I decided to have a phone call with them. The call was short, they joked a lot and the wife and I talked about books and music we liked. I decided we needed to set up a meeting in person, I wanted to meet the family I would choose for my family before I made any decisions. The day came for our first meet up, I was very nervous. I hoped that the family would like me too and wouldn’t judge me for the mistakes I had made. My caseworker met me at the restaurant and told me that unfortunately the wife was very sick and wouldn’t be able to meet me but her husband would be there. I was a little disappointed, but I was happy that she cared enough about me and the baby to not get us sick. She sent a very well-written letter and goody-bag full of snacks and music with her husband which I thought was so sweet of her to do. The husband was kind of shy but had a warm smile and talked highly about his wife. To me they were perfect, I finally found the family who would raise my baby boy and give him the life he deserved. It was a very profound moment for me, I felt like a weight had finally been lifted off my shoulders because I finally had a plan. A sadness sank in, though, I finally had a plan but it didn’t involve me parenting my baby boy that I had grown to love over the past 8 months. One week after our first meeting, I was sitting at home feeling very miserable and pregnant watching TV. I finally put my two weeks’ notice in at work, so I had spent a lot of time at home just being lazy, getting bigger, and alone crying over my belly, trying to soak up my last few weeks I had being pregnant. I was at almost 39 weeks at that time. I went to stand up and when I scooted forward I felt a wetness like I had peed my pants. I thought had lost all control of my body at that point, and I went to go clean myself up when more wetness was felt. I then realized that my water had finally broken, I called the hospital and told the nurse what had happened. She told me to come into labor and delivery, so I then called my mom to come pick me up because I was too scared to drive myself. I labored through most of the night and even got a little sleep after I got the epidural. My mom and sister slept on pull out couches in the same room as me. The next morning it came time to finally push, my mom and sister had to help because I couldn’t feel my legs. At 10:07 in the morning, after 45 minutes of pushing, I finally gave birth to a 10.7 lbs baby boy. I cried, he cried and when the nurse finally placed him on my chest an overwhelming feeling of love rushed through my body. I just laid there looking at him, at his perfection. I couldn’t believe that my body created this perfect child and that the baby that had been playing soccer on my bladder just days ago was there in my arms looking at me with his beautiful blue eyes. That whole first day I held him and loved him as much as I could. In my mind I saw a ticking clock, I knew my time was limited with him. In my state a mother has to wait 48 hours after birth, before she could sign her termination of parental rights papers. That wasn’t nearly enough time for me. I knew the agency wasn’t going to give me much time after that before asking me to sign my rights away. The day he was born, I emailed the family I picked out attaching a few pictures of him. They immediately emailed back about precious he was and hoping that I was recovering well. We agreed to have a call the next morning so that I could just talk with them and also so they could tell me the name they had picked for him. I had been calling him C (for privacy I won’t disclose his name) during that time, but I knew the family would probably change that name. The next morning when they called the first told me that they decided on a name that started with a T (for privacy I won’t disclose his name), and then they told me that they had decided that they loved the name C and that they wanted to keep it as his middle name. They told me they knew how important that name was to me, and wanted to keep it to honor my connection with T. I was so happy for that, at that moment I knew I had picked the right family. That last night in the hospital was probably one of the worst nights of my life. My mom had been staying with me but decided that she needed to go be with her husband, who at that time was very jealous that she was spending so much time with me. I was alone with T for the first time, and I didn’t want to put him down. I held him and cried over him while feeding him a bottle of formula, a few nurses offered to take him for me but I didn’t want to let him go. It was my last night as his mother and I wanted to soak it all up. Some other nurses heard about my crying and how I was placing him for adoption. They offered to get me a car seat, so baby clothes, and formula so that I didn’t have to give him up. It was a nice gesture, but it hurt so badly because I knew even if I had that stuff, I still didn’t have a place to go with a newborn. We would have been homeless if I had decided to keep him. There’s a song by Maroon 5 called “Daylight”, every time I hear that song it brings back those memories of that last night with him and how the morning came too fast. That morning I begged for one more day with him, I just needed a little more time but my insurance wouldn’t pay for another night, I was getting discharged. My caseworker came by, she met my mom and baby T. She explained what forms I was going to be filling out and how it would all happen. She warned me that the language in the parent rights papers was harsh, and she was right. The wording made it sound like I didn’t want my baby at all and that I was basically abandoning him. It was hard to sign because I knew none of that was true. I had to write the reasons why I was signing my rights away as a parent, so I simply put “I want my son to have a better life than what I capable of giving him at this time.” The last few signatures were so hard, I had to stop and cry. I didn’t know how I could continue, so I ask my mom to pray for us at that time. I’m not religious, but at that moment it was the only thing I could think of doing. I sign my last signature and I felt my heart break into a million pieces. The nurses brought T back into the room, and I dressed him in a going away outfit that my caseworker brought for me. I held him and cried. I kissed his forehead and told him how much I loved him. My mom watched over him and took videos of him sleeping while I packed my things to leave, each step felt like I was walking through mud. I kissed him one more time and grabbed my bags and started walking out of the hospital. Leaving without you baby from the hospital is probably one of the worst feelings to ever experience as a parent. I didn’t want to have placement (giving baby T to the family I chose) with his new parents at the hospital, I felt like having him in transitional care (temporary foster home) for a week would give me some time to get my emotions under control so that I could try and enjoy the placement itself. We planned on doing the placement at the agency the Monday after we left the hospital. I spent my first night without my baby at my mom’s house, and I remember walking around feeling numb and empty. I was highly aware of all the moms and babies when we went to the grocery store for dinner. The next night I spent at my home, even though I wanted to stay with my mom her husband didn’t want anything to do with me. Three days after signing my rights away, and leaving the hospital I was by myself. I was washing some clothes I had bought for my son before he was born, I was planning on giving them to his new parents on placement day. An overwhelming feeling of regret washed over me, I wanted my baby back. I had made a mistake in signing those papers, and I wanted to take it all back. I did some research online, but unfortunately in my state once you sign the termination of parental right papers there is no way to undo it. I felt my heart breaking, even more, I knew I had made a mistake but there was nothing in my power that I knew of to get him back. That whole week leading up to placement day was so hard on me, I constantly worried about T and how he was doing. When placement day finally came I was so excited to get to see T again, I got to hold him and feed him for a couple of hours before it was finally time to introduce him to both of his new parents. I had never met the wife before this moment, so I was so nervous. I hoped that she liked me and trusted me since I was trusting them to take care of T and raise him. As soon as I walked into the room holding T I saw two people with huge smiles on their faces. They came up and hugged me first, and then I handed T over to his new mom. She just stared at him with love in her eyes and hugged me. His new dad got a turn to hold him for a bit as we sat and talked, I gave them the clothes, a baby blanket I made for T, and his mom a bracelet that had a blue baby shoe on it with a cross. I had matching one as well. They gave me a bouquet of flowers a couple of necklaces, the first necklace had a circle with the letter C stamped into it with “One in a million” engraved in the back. The second necklace had two little gold and silver heart charms that represented my heart and baby T’s. I started crying because the gift was so thoughtful of them, I still wear the charms today that I eventually combined into one necklace. T’s dad then handed him back to me, and I held him while we talked more. We took a few pictures together, and then it was time for me to leave. I was still holding T, so I just stared down at his perfect face as my eyes welled up again. I stroked his cheek, and he smiled. I finally kissed him on his forehead like I did at the hospital, and handed him back to his mom. We hugged some more, and I left the room with my mom. I barely made it down the hallway before I completely broke down, I could hardly walk to the car. I didn’t know when I was going to see him again, I didn’t know if his parents would keep up on their end with the open adoption agreement. There was a lot of unknowns in the beginning, and still are a lot today two years later. I’ve experienced many changes since then, and I have many battles with depression and anxiety. I’ve started working on college and met the perfect man whom I married. My adoption hasn’t turned out the way I hoped it would, but I did have a lot of big expectations and there is still many years to go so things can change. Getting pregnant with T was probably one of the best things to happen to me in my life, his presence in my life really made me who I am today. My experiences with adoption are still shaping me, I’ve lost friends and family but I have also gained new people in my life who truly care about me. I still get updates about T, and currently, we have two visits a year which I am very grateful for. Even though I may sometimes still regret signing those papers, I still love his family. We have had our ups and downs but in the end the love T and that’s all that matters to me now. I can’t change what happened in the past, I can only learn and grow from it. I hope that this honest telling of my story may help other mothers who are experiencing the same journey as me, realize that they are not alone. I don’t want others to feel sorry for me, I just hope that sharing my story will help others in adoption learn. Adoption is hard and messy. It’s full of complex emotions from everyone, and it’s a learning process as you go.